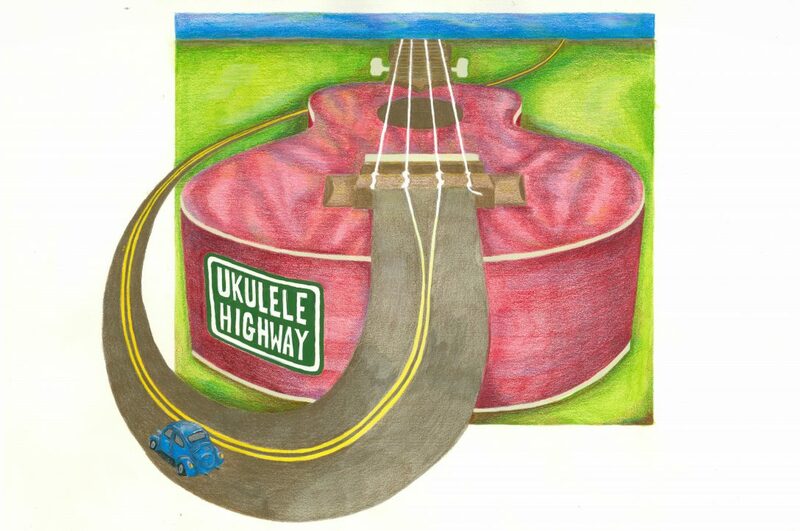 Ukulele Highway Podcast co-host Ep1, Dr Andi, Four fingers and Four Strings. Yee Haw! Co-hosting with me on the first Ukulele Highway Podcast will be Dr Andi. I’m so thrilled to have her along for the ride. She is a pod mother to many and former member of Melbourne Ukulele Kollective (more on MUK coming up in our first episode!) Here is Dr Andi’s ukulele journey…. How did you discover ukulele? I was so moved by the Hawaiian chap, Israel Kamakawiwoʻole music I bought his CDs and it inspired me to try the Uke. I loved the fact it looked like a toy it was easy to hold and easy to start self-learning from books and a video I found in a music shop. You got love the fact that we have four fingers and there are four strings. Much better than six or god forbid 12 stringed things. I think I then saw a newspaper article about the Melbourne Ukulele Kollective. I remember thinking that’s exactly what I need to do to ward off the daily demons of life – keep learning this instrument and eventually sing and play music with a local community group. I tracked them down to a pub in Queens parade. They had only been running for a short period of time, I was at Port Fairy Folk festival I didn’t plan to play with them as I wasn’t quite stage ready but I had my Uke with me at Port Fairy cos I carried it everywhere on the weekends and they let me join in with the easy songs. Yay, I had made it, I was singing and playing with a community group. It doesn’t get better than that! Instant community joy and daily doses of self-medicated with music therapy. What is your fondest ukulele memory? Playing ukulele on ABC’s Spicks and Specs program and at Joan Kerner’s farewell from public life concert are up there with being greatest joys of playing uke. Fun costumes is also up there but I would have to say I remember the day I was rhythmically tapping my fingers on a table a realised my lefts hand finger sounded different to the right-hand fingers. The callouses and thickening of the finger tips on my left hand were well established to create a different drumming tone. I had arrived I was a ukulele player, either that or I needed softer strings. Are you still playing ukulele? I get it out occasionally although I am not really playing Uke anymore. My current community musical hobby is ‘clogging’, a rhythmic Appalachian mountain style of tap dancing. It’s a real hoot! A hootenanny if you will! The bluegrass clogging music often has great ukulele banjos (the ukulele BFF and cousin). I like to think I have passed on the spirit of the ukulele to others as I got MUK on radio at 3RRR where I first heard Issy the Hawaiian chap. I also helped create other Ukulele enthusiasts, I bought my cousins and other relatives ukuleles and set up a Uke group at Museum Victoria where I used to work. My love of community performance, song and dance is something I will never fall out of love with. I just changed music expression from fingers to feet. Yee Haw!